A hot pizza stone, some extra pizza dough, and a lonely anchovy spell pizza mischief. As I stretched out the pizza dough for my large mushroom pizza, it pulled inches beyond my wooden peel, and I realized I had some dough to play with. Even when I’m making one pizza, I use two pizza stones on two shelves to get a brick oven effect. So I could easily make a small extra pizza. I sliced off the excess, overhanging dough from the large pizza, rolled it back into a ball, then quickly stretched it out into a six-inch diameter disk and laid it on a second wood peel. I had to act quickly because the first pizza would be slowly settling onto its peel and could start to stick if I didn’t get it made up and in the oven quickly. So I built the mushroom pizza while the other mini pizza base waited. Since this mini second pizza would bake faster in the oven, I slid the large pizza onto the first pizza stone, then quickly turned to the mini. In a white flash of inspiration I decided to make a white pizza. I had an open can of anchovies from making the accompanying Caesar’s salad. (Someday I’ll share this recipe.) I smeared the dough with light coating of oil from the can just to set the fishy theme. Then I broke a slice of provolone cheese into a few pieces to loosely cover the oil. 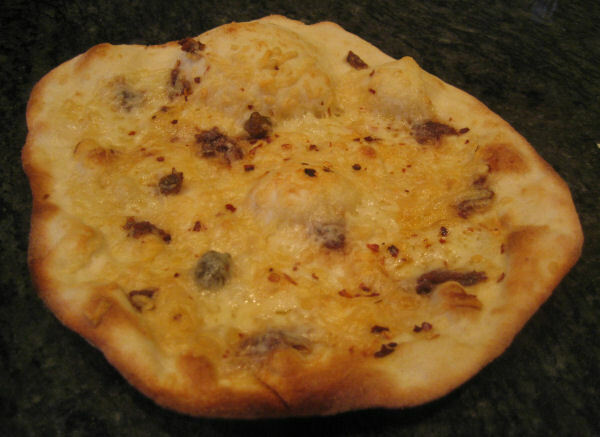 Next I unrolled a remaining anchovy filet, broke it into little bits, and distributed them over the pizza. I included its caper, too. Any excess anchovy on my fingers got wiped onto this palette as well. I finished this baby off with a sprinkling of red pepper flakes and, lastly, a drizzling of just a few shreds of Parmesan and mozzarella. Because this pizza was so small and light, there was no need for cornmeal to facilitate sliding it onto the stone. Its small size also meant it baked quickly enough to time out with the larger pizza that had a head start. Actually, next time I would bake the mini pizza for an even shorter time. At 550 degrees F, small pizzas with light ingredients bake in a few minutes. When pizza-making opportunities come up in the moment, make the most of them. Try something new. Surprise yourself. That’s one way to keep pizza really fresh. What pizzas have you thrown together on the fly? This entry was posted in pizza dough, pizza stones and tagged anchovy, make pizza, pizza stone, two pizza stones, white pizza, wood pizza peel. Bookmark the permalink.